Originally published under the title "Terror-Linked Charity Islamic Relief Escapes Ban on Receiving Your Tax Dollars." 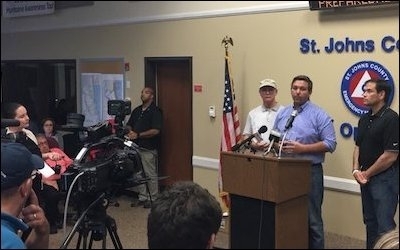 Rep. Ron DeSantis briefs local media on the Hurricane Irma response in St Augustine, FL, on September 12. IR's claims are patently untrue. Representative Ron DeSantis explains: "Due to Hurricane Irma, I left Washington on Thursday to help my family and community prepare for the storm. I was thus unable to offer my amendment, but remain committed to blocking taxpayer funds for organizations with ties to terrorist groups such as Hamas." Banning government grants to Islamist groups is a necessary step in the fight against extremism. 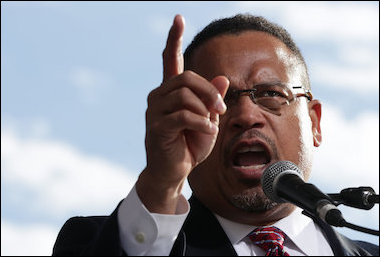 Rep. Keith Ellison falsely assured his colleagues that "IRW has never been affiliated with Hamas or the Muslim Brotherhood." There are plenty of Islamic charities whose officials & guest speakers do not advocate killing Jews & U.S. troops. Islamic Relief is a dangerous organization. In America and Europe, it brings extremist preachers to speak before Muslim youth; and overseas, it is financially connected with violent Islamist movements. There are plenty of Islamic charities, worthy of support, whose officials and guest speakers do not advocate killing Jews and American troops. Islamic Relief is not one of them. Islamist duplicity must be revealed, and the taxpayer must stop subsidizing this global charity's extremism.